Sometimes after a heavy and rich meal we like something divine and light to finish on a sweet note. 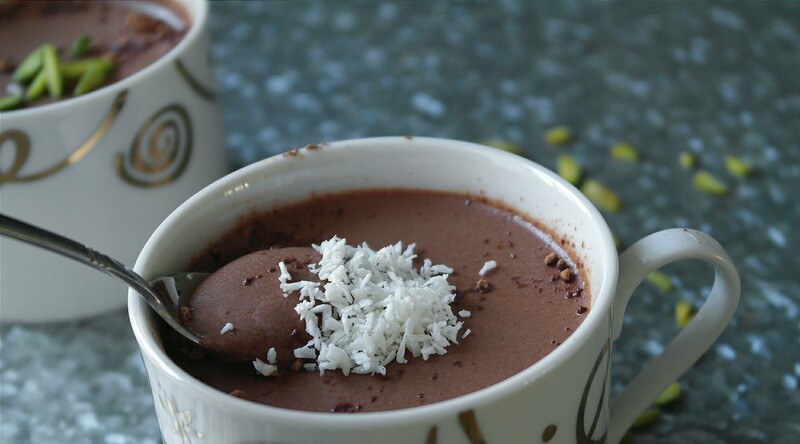 So, instead of the full-fat raw cream and eggs to provide the smooth base for our chocolate concoction we will be using coconut cream. It gives the perfect, most ideal texture and consistency, that you wouldn’t be able to tell the mousse is any different to that of the classic Galaxy. For those of you who don’t know, coconut milk is not the liquid from inside the nut, but the extract of freshly grated coconut flesh. The flesh is first soaked in hot water, then allowed to cool, after which the liquid is strained off. This process yields both coconut milk and coconut cream. The two liquids will separate when left to stand and the thick white cream will rise to the surface of the liquid leaving the clear watery milk below. Its’ cream is rich in fibre, vitamins C, E, B1, B3, B5 and B6 and minerals including iron, selenium, sodium, calcium, magnesium and phosphorous. Unlike cow’s milk, coconut milk is lactose free so can be used as a milk substitute by those with lactose intolerant, like myself. Now let’s go ahead with how to make it; keep in mind, you only need 4 ingredients!! 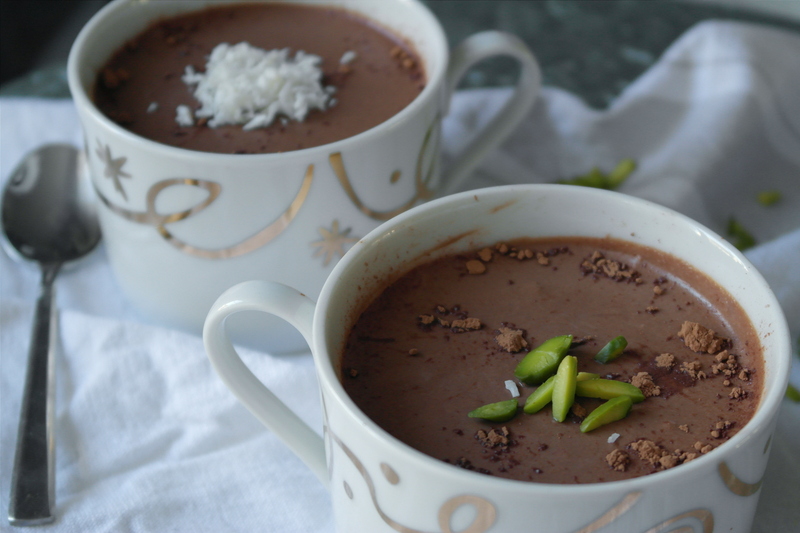 Scoop out only the coconut cream from the cans, leaving behind the milk (clear liquid) and place into a mixing bowl. Add in your sugar and cacao powder and whisk. Using a food processor, blend the dates into a paste. Add it into the mixing bowl and whisk once again. 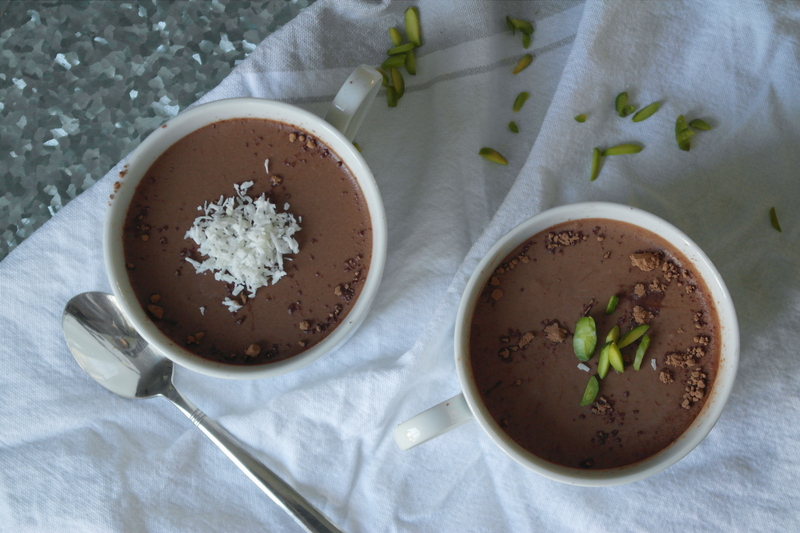 Fill little cups with the mousse, sprinkle with grated chocolate/pistachio/coconut flakes. Place into the fridge for a minimum of 3 hours and then serve!